After over 2 years of hard work, research and endless editing, finally my new book is ready. The title is called “Unleash Your Vitality”. As with many projects, in the beginning you have a working title and in more later stages a more final titel develops. 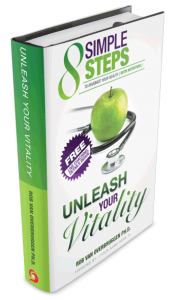 Unleash Your Vitality is the final title. There is alot of talk about nutrition this and that and how it influences health. I wanted to look into the scientific papers (just like I did with Healing Psyche) on how superfoods and other nutritional elements effect the health and vitality of a person.This is not just a persons view, there are 396 scientific references cited here. This book ik written as a action book, not just a read book.Many exercises to enhance personal insights. Currently I am talking to a few printers to create a very EXCLUSIVE LIMITED EDITION HARDCOVER that is only going to be on sale for pre-orders. When you look on facebook you will see that this is offered to people for 35euro (ex shipping). Even this is a discounted price as this is normally the price for a general softcover and non signed edition. The pre–order is a exclusive hardcover and signed edition that is now available for only 35Euro. Some people already ordered 10 copies to give to their clients or for the use as gifts. It is a great gift to people who are health conscious.If you are working in the health area, this book is also a great business builder. For you one copy is only 35 euro, or if you want to buy more 4 copies for 100 euro. This is the best offer I will make. The price will never ever go below this. Just let me know how many copies you want to order. If you want to buy more than 4, just drop me an email for special bulk prices. Remember: This is a EXCLUSIVE HARDCOVER SIGNED EDITION. Do you want more copies? Do you want your name on the cover? Your foreword will be included?